Josh Eichorn: raising his tray table to the upright and locked position. Malcolm Dragon visits his father in Stronghold Penitentiary where he catches Dragon up on recent events. Angel has moved out of Mildred Darling’s house as she could not stand to live in the same house as Frank now that it has been revealed that he slept with Tierra Jones and that is now pregnant. Malcolm also notes how he is now dating Maxine Jung Lai and has moved on. He is advised by Dragon to use protection if he starts sleeping with his new girlfriend. Dragon then has to return to his cell to prepare for the trial. There is only a couple of months left before it begins and he is wished good luck by Malcolm. The weakened Flash Mercury wakes up in the apartment home of PowerHouse and laments about how he has now reverted to his powerless, crippled form. He is pleased when PowerHouse reveals that he has had Flash’s mask retrieved. The mask will be turned over but not before they figure out a way to salvage some good from Flash’s time as OverLord. Fever leaves the two to speak and thrash out their new working relationship. Battle Girl defeats another super-freak menace before getting approached by SuperPatriot. He is assembling a new version of the Special Operations Strikeforce. He would very much like Angel to sign up for the government team. The promise of extra training and working with a team of professionals is tempting but Angel needs time to think about the offer. She later meets up with Malcolm who tries to get her to cut Frank some slack over his tryst with Tierra. Had he not turned her down during the invasion, they may have ended up sleeping together in the same manner that their respective exes did. The trial for Dragon commences with Judge Coffin presiding over the affair. The prosecution questions a number of celebrities that had been brought in by Abraham Smith to help clear Dragon’s name. Rex Dexter talks about the attack by Universo but the opposing lawyer merely states that Dragon had to defeat the Devourer of Worlds in order that his people could come to inherit the Earth once humanity was exterminated. SuperPatriot is then questioned about Dragon overthrowing CyberFace’s regime. Again, this act of heroism is turned into a scenario where Dragon needed to eliminate a rival to make Earth safe for his people. News coverage of the trial is shown far and wide and numerous people react to Dragon’s plight. Ronald Winston Urass declares that a good Dragon did indeed exist but he was murdered by Emperor Kurr during a clash that killed thousands. 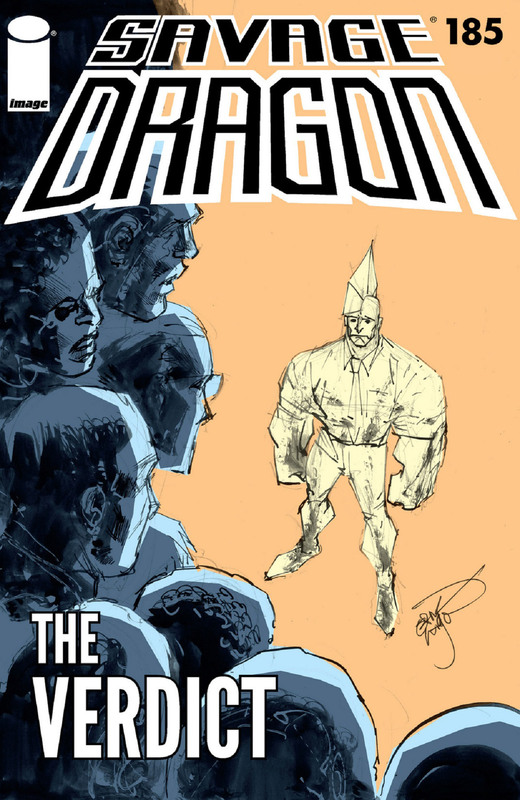 Reverend Parasol of the Church of Savage Dragon claims that Dragon’s resurrection is further proof that his word is sacred and that he should be spared. Harry Paratestees mocks Dragon’s popularity and how he is unintentionally aiding other unpopular people look good in comparison. Mako is enjoying Dragon going through a mass murder trial and is following intently. The long-absent Alex Wilde wishes that she could somehow aid Dragon but Chris Robinson points out that they are powerless to help. Frank pleads with Tierra to have an abortion as he is nowhere near ready for the responsibilities of being a father. This request is turned down and a tearful Tierra begs for Frank not to leave her to raise their child alone. Angel later attempts to make amends with Frank but he informs her that he has asked Tierra to get married. She cannot bring herself to attend the ceremony but Malcolm goes, a move that is appreciated by Frank considering the distraction of the trial of his father. The testimony given by Angel appears to have gone badly as her words were turned against both her and Dragon. Captain Stewart is next to be called to the stand and he does his best to point out that Dragon and Kurr were completely different entities. The prosecuting lawyer then asks the officer if he would ever considering taking Dragon back onto the police force despite the possibility of him becoming Kurr again. He reluctantly admits that he would not accept Dragon back. Dragon finally takes the stand and gives a speech about how his previous persona of Emperor Kurr was eliminated by his own people. His origins are then explained and he assures the court that any trace of Kurr was eradicated from his brain when DarkLord resurrected him. The fact that the Tyrrus Combine on Kalyptus were exterminated by Dragon following his return. Dragon stands by that decision but his willingness to commit genocide is enough to condemn him in the eyes of the lawyer.